Embracing the trends in food delivery. Our suite of tools for meal deliveries is unparalleled. With more and more people using the services of big businesses like Blue Apron and HelloFresh, it’s hard for smaller companies to keep up. Our delivery software for small businesses helps create a logical ordering, packing, and delivery process for meal deliveries. 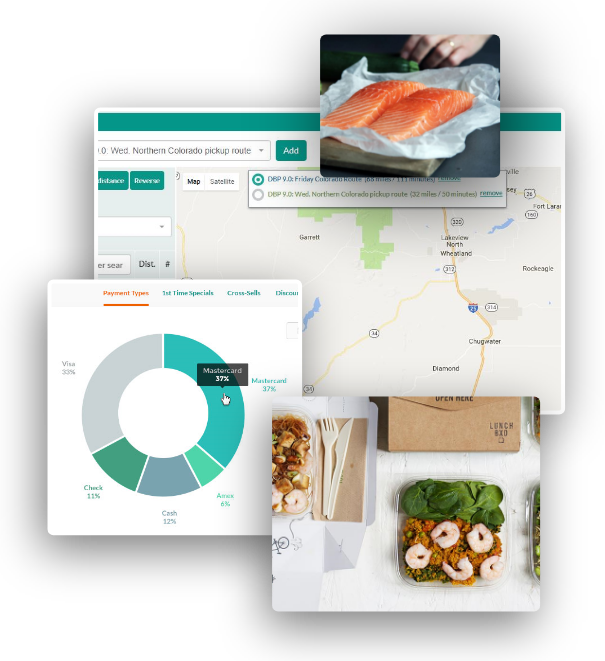 With a full service customer marketplace frontend allowing order edits, recurring items, automatic intelligent route assignment, and billing built right in, you can’t go wrong with our food delivery software. Whether you’re working with produce, milk, meat, or other food products, we’ve got the industry-specific features you need. Got glass milk bottles or plastic bottles you need returned? How about milk crates? How about coolers? Got a cool front porch milk box you charge a deposit or purchase price on? Our system is robust enough to handle many different types of deposits – whether they are tied to a specific product, every single order, or a one-time deposit, we’ve got you covered.